Croissants dusted with sugar and filled with Nutella. Hmmm. Maison Keyser, fluffy but not buttery enuf! It seems ironic that the best croissant I’ve had in recent memory comes from a British chain sporting a French name. Pret a Manger (Ready to Eat) or “Pret” as the Brits call it is a 350-store chain that opened a franchise in our Morningside Heights neighborhood, much to my chagrin, at first. We’d just seen the abandoned building that housed Chinese stalwart Ollie’s give way to a Shake Shack. “These college kids with their Shake Shacks and their Starbucks and their Pret a Mangers!” I fumed. But then I went in the cheery space with its large lettering boasting of its organic ingredients and food that is truly “ready to eat” (all leftover food is donated, the website says). I saw rows of plain croissants that looked anything but mass-produced. 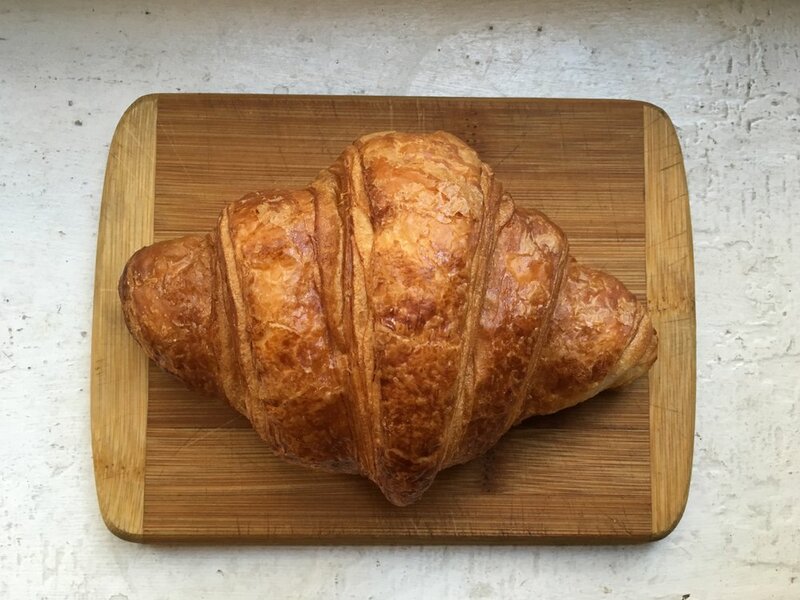 Each one had different folds, and I could already tell, before I even held the still warm croissant in my hand or took a bite, that they were both light in layers and dense with butter, like the croissants I had growing up when I went to my best friend and neighbor’s house. Jackie Hewitt’s mother Trudy hailed from Switzerland and was quite a cook. When she made croissants it was a 24-hour process that involved much folding of dough, much basting with butter, much time for rising. I remember sitting politely at their table in the house that always smelled of stew simmering, wanting another and another and another, but politely refraining, the same way I must now restrain myself from going up to Pret every day for this emminently affordable ($2.49) and satisfying, albeit fattening (280 calories) treat. 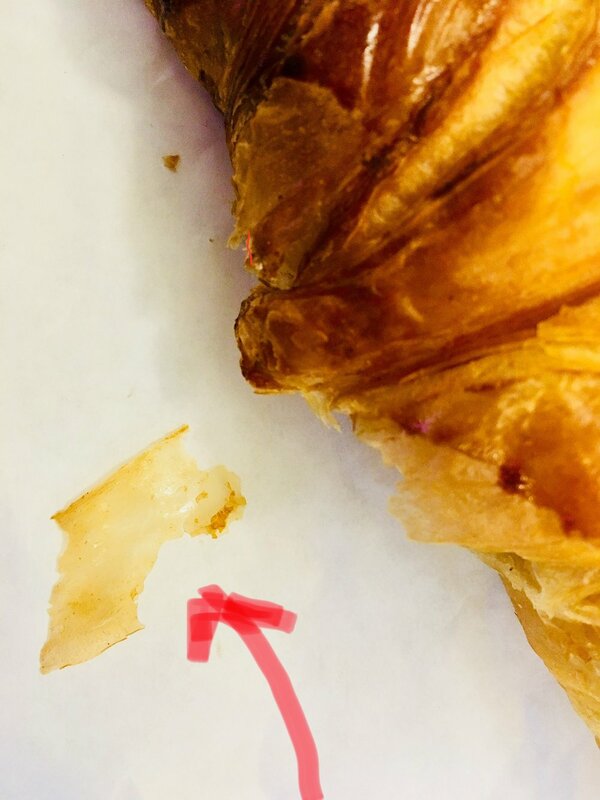 But it’s a necessary treat in New York City where croissant quality ranges between stodgy stale-tasting plastic wrapped deli abominations to ones that look like they should taste excellent—crisp tawny curls of dough on top and hollows inside for jam—but which never taste “just right” to me. The latter typify the croissants at Maison Keyser which, according to opinionated Olga, makes the best croissants. I begged to differ. I remembered eating there with a French professor client (feeling a bit guilty of carrying coals to Newcastle by suggesting the outpost of the original Parisian bakery). I gathered he was not so impressed with the dry and airy MK croissant, because he proceeded to tell me that the best croissants he has ever had were at a luxury hotel in Japan. Maybe it’s time to try the croissant at Korean-owned Paris Baguette? Who knows it could outshine Pret yet.